Most of us are familiar with “traditional” mystery shopping gigs – the kind that involve in-person on-site visits to the business being evaluated. But did you know there are also Telephone Mystery Shopping jobs? That’s right! Dial… Evaluate… Ka-ching! Generally, the work involves calling companies and posing as a potential customer to see how they handle the call. At the end of the call, you complete a report with your findings and feedback from the call. We consider these “extra money” gigs as opposed to jobs and, in most cases you will be an independent contractor rather than an employee. That said, the work can be interesting and who couldn’t use a little extra money?! 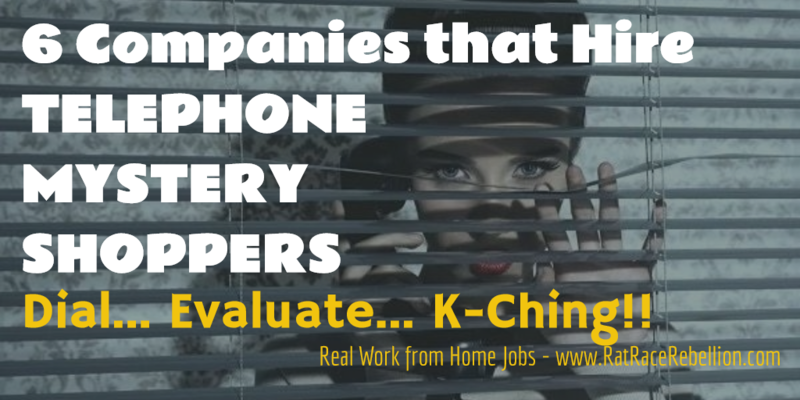 Following are 6 companies that hire work from home Telephone Mystery Shoppers. They may not all be hiring today, but keep them on your radar as they all hire on a routine basis! teleXpertise regulary hires both Telephone Mystery Shoppers and Call Evaluator/Quality Call Analysts. Telephone Mystery Shoppers are responsible for making calls to the companies they are evaluating, so you must be comfortable initiating contact with strangers. According to their site, “Most assignments offer compensation of $3 to $10 per completed shop depending on the complexity of the shop,” and you can expect to earn between $50 – $75 per month in the early stages of your work with them. Click here for more about opportunities with teleXpertise. Perception Strategies specializes in Healthcare Mystery Shopping and offers both traditional “in person” shops as well as telephone shops. At the time of this writing, they are not actively looking for telephone shoppers, however, the indicate that they are accepting applications and you will be notified when they are hiring again. Click here for more about opportunities with Perception Strategies. If you visit our Newest Job Leads page on a daily basis (which you should if you want to be on the lead edge of the latest jobs we’ve found), you will have seen when we posted about Yardi Matrix hiring for their Spring 2016 rent survey. They will be hiring for their fall survey in August, so make a note on your calendar AND watch our site because we always post their openings early! Click here for more about opportunities with Yardi Matrix. Call Center QA contracts telephone mystery shoppers and pays $5 for each completed call and feedback. Each call will be between 5-10 minutes long, and it should only take a few minutes to complete the post-call feedback form. As we understand it, the first shop will happen shortly after hire, but additional shops may take a while to come in as they are assigned based on your profile and how it matches the needs of their clients. Click here for more about opportunities with Call Center QA. ARC hires home-based workers to complete telephone mystery shops, customer care satisfaction surveys, and competitor analysis calls. It appears that they pay every two weeks and that pay ranges from about $3 per call up to over $12 per call depending on the depth of the assignment. Click here for more about opportunities with ARC Call Performance Solutions. InteliChek hires independent callers to gather make calls to companies and inquire about services and pricing offered while posing as a household consumer. Currently, they are looking for canidates who can work 15-25 hours a week. From what we can determine, pay is “per call” and ranges from about .30 cents to almost $2 per call, with calls lasting under 5 minutes each. Click here for more about opportunities with InteliChek. This entry was posted in Earn Extra Cash, Mystery Shopping and tagged Telephone mystery shopping. Bookmark the permalink.